The attacks also came after talks between Afghanistan, Pakistan, the US and China at the start of the week seeking ways to end the Taliban's 16-year insurgency. A spate of deadly Taliban attacks targeting Afghan forces this week was a show of strength against Donald Trump's new strategy, and signalled a push to strike security bases rather than cities, analysts said. In three of the four ambushes since Tuesday, militants used bomb-laden Humvees to blast their way into targets, seeking to demoralise war-weary security forces, and steal weapons and vehicles to fuel their insurgency. It marks a change in focus from recent years when the Taliban fought to control and hold provincial capitals, such as the northern city of Kunduz, which briefly fell to the militants twice in the past 24 months. “(The Taliban) want to be showing their potency after the summer unveiling of the Trump policy of staying on with larger forces,” said Vanda Felbab-Brown, senior fellow at the Brookings Institution. “They haven't tried to hold provincial capitals... they are not wasting their assets on that.” Militants have launched several devastating assaults on security forces already this year, including an attack on a base in northern Mazar-i-Sharif in the spring in which at least 144 people were killed. But this week stands apart for the number of attacks on security forces in such a short time — five in as many days with around 150 military, police and civilians killed — and coming after the US and Afghan forces have stepped up their own offensives. Two separate attacks on mosques — one of which was claimed by the militant Islamic State (IS) group — took the overall death toll to around 200 for the week. In August, Trump announced that American forces would stay in Afghanistan indefinitely, increasing attacks on insurgents and deploying more troops. Following his announcement the US has dramatically ramped up airstrikes, with more bombs and missiles dropped in September than in any month since October 2010. A recent flurry of drone strikes in the lawless region near the border with Pakistan has also seen dozens of suspected militants killed. This week's attacks are the Taliban's response, a spokesman told AFP, calling it “a clear message... The enemy who thought they had scared us with the new Trump strategy have now been given a lesson”. “I think the Taliban wanted to send a very strong message that it prefers to fight rather than talk and that it has the ability to fight very well,” said analyst Michael Kugelman, of the Wilson Center in Washington. The message has proved devastating: hundreds killed and wounded over a bloody few days that left military bases and police headquarters destroyed or severely damaged. 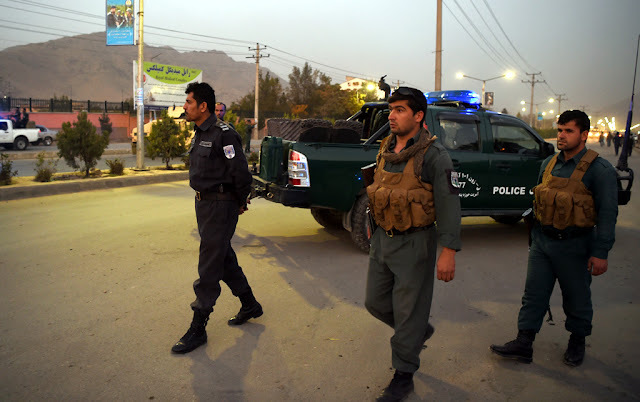 The deadliest attack was on a police compound in the city of Gardez, where Taliban militants detonated three explosive-packed vehicles including a Humvee. At least 60 people were killed in the blasts and ensuing battle, officials said. The militants also attacked a police headquarters in Ghazni twice, and detonated a suicide bomb on Afghan police trainees in Kabul that killed 15. Attacking security targets kills three birds with one stone: it allows the Taliban to deflect criticism over civilian casualties, devastate Afghan forces, and steal equipment. The Taliban has acquired “dozens” of armoured Humvees and pickup trucks in recent years, defence ministry deputy spokesman Mohammad Radmanesh told AFP. “The Humvees and other military vehicles are stronger than ordinary ones and you can load a lot of explosives in it,” General Abdul Wahid Taqat, a former intelligence chief, told AFP. “I would think that could be pretty demoralising for Afghan forces knowing that their own weaponry is being used against them by the enemy,” Kugelman said. Such erosion of morale can be lethal, as officials have previously pointed out. Afghan forces, already beset by desertions and corruption, have seen casualties soar to what a US watchdog has described as “shockingly high” levels since NATO forces officially ended their combat mission in 2014. Morale is further eroded by long-running fears the militants have insider help — everything from insurgents in the ranks to corrupt Afghan forces selling equipment to the Taliban, said retired Afghan army general Atiqullah Amarkhail. The question of how to ward off such guerilla attacks is one that officials have not yet been able to fully answer. One security source who spoke anonymously to AFP said Afghan forces should “come out of their bases and choose offensive mode”, warning that areas patrolled by police at night are safer than places the army is deployed. Felbab-Brown said strengthening checkpoints and improved information sharing would also help. For Kandahar's police chief General Abdul Raziq, more and faster airstrikes would put a quick end to hours-long assaults such as the one in Gardez this week. “The Afghan air force should be equipped as soon as possible,” he said. Raziq said the week's attacks were not a response to Trump but the militants lashing out after failing to achieve their goals during the summer fighting season. The Taliban have already threatened more attacks, and Raziq called for swift action. “Instead of being concerned, we have to take necessary measures,” he warned. A spate of deadly Taliban attacks targeting Afghan forces this week was a show of strength against Donald Trump's new strategy, and signalled a push to strike security bases rather than cities, analysts said. In three of the four ambushes since Tuesday, militants used bomb-laden Humvees to blast their way into targets, seeking to demoralise war-weary security forces, and steal weapons and vehicles to fuel their insurgency.